Bed bugs are parasitic insects best known for their love of feeding on blood (usually human) and making homes in warm, enclosed spaces – usually bedding of some sort. They’re small, usually between 4 and 5 mm long, and are reddish-brown in color. Blood is all they eat, and they don’t need a lot of it to survive which means that they’re able to hide away for long periods of time, only coming out of hiding during cool nighttime hours. They’re slower at reproduction than comparable insects with a typical adult female laying one to three eggs per day, with each egg taking two months from being laid to becoming an adult. Even with slow reproduction, because they’re good at hiding, it’s easy for them to build their numbers. The biggest potential issue with bed bugs are bites, since blood is their primary food source. Common symptoms of bed bug bites are itching, welts, and swelling. Bed bugs are not known for transmitting diseases, though there is the chance of secondary infection that comes from scratching and picking at bites. Long story short, bed bugs are low on the totem pole when it comes to potential dangers but that doesn’t mean they can’t cause problems if they’ve infested your home or business. Bed bugs are consummate hitchhikers – you can pick them up just about anywhere and once they’re on you, all they have to do is jump off and make a nest once they’re inside your home or business. A common way to bring bed bugs into your home is from them grabbing a ride in your luggage while you’re traveling, but they can also find their way onto your person at the office, gym, or even from a taxi ride. The best way to prevent bed bugs from getting into your home is by making sure they don’t hitch a ride on you in the first place. If you’re traveling, make sure to check your hotel room by lifting the sheets, looking under pillows, and checking cushions before settling in or opening your bag. Tips for keeping them from reproducing in your home include always washing all linens on the highest temperature you can, avoiding the purchase of second hand furniture, and keeping clean, removing the sort clutter where they can hide. How can Gregory Pest remove bed bugs from my home or business? Gregory has bed bug sniffing dogs available when needed such as multiple apartments, hotel rooms or large buildings. Their keen sense of smell allows our experts to find bed bugs and destroy them quickly and efficiently. Finding the bugs is only the first part of the process, eliminating them is the second. Our Thermal Remediation® Heat Treatment equipment is a self-contained system that utilizes space heaters and monitoring devices which are powered by the system and monitored throughout the process to achieve a safe and effective level of heat within the treated areas. 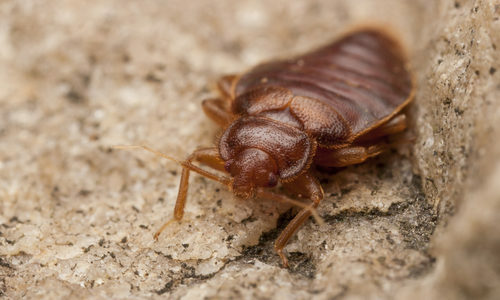 The heat kills all stages of bed bugs: eggs, young, and adults. The entire treatment area is heated to 120° F. or higher. Once the heat in the treated area reaches the optimum temperature, it is maintained for 4 hours in order to ensure complete eradication of the infestation. The hot air is circulated using fans, and temperatures are monitored throughout the treatment area(s) during the process. An application of residual insecticides may be made into the cracks and crevices where any surviving Bed Bugs might be crawling. In most cases, this process eliminates all Bed Bugs within the treated area(s). After the treatment is complete, the Gregory Specialists will disassemble and remove the equipment and do a final inspection to make sure all Bed Bugs are gone. Call Gregory Pest Solutions for help with bed bug Thermal Remediation® treatment at 1-800-922-2596 or use our email form to contact us today.